Introduction EMSL Analytical, Inc. has 16 CDC ELITE testing labs to help prevent Legionella outbreaks. In January, a hospital in the state of Pennsylvania discovered that Legionella was present in multiple water sources after routine testing. While no cases of Legionnaires’ disease have been reported following the latest findings, the same hospital had a Legionnaires’ disease outbreak a few years ago that infected approximately 22 patients and claimed the lives of five people. Legionnaires’ disease is a severe form of pneumonia that is caused by Legionella bacteria and is fatal in 10% of cases. Legionnaires’ disease is not communicable but when Legionella is found in water sources it can be contracted when it is aerosolized and then inhaled by susceptible individuals. Symptoms often include fever, chills, coughing and shortness of breath. EMSL Analytical, Inc.’s network of Legionella testing laboratories provides Culture Testing, Polymerase Chain Reaction (PCR), Sequence-Based Typing and Whole Genome Sequencing. For more information about the difference between culture and molecular testing, please contact Christopher Goulah, Ph.D., at (716) 651-0030 extension 1407. As an added resource, EMSL supplies a free Legionella Pocket Guide that includes important information on the bacteria along with different sampling techniques. Click here to request a free copy. Additionally, EMSL offers a range of free webinars, including presentations about Legionella and other environmental topics. To view EMSL’s complete list of free webinars, please click here. 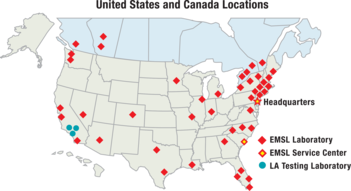 To view a complete list of EMSL’s Legionella laboratory locations, accreditations and capabilities, please visit www.legionellatesting.com. For more information, please contact our Customer Service Center at (800) 220-3675 or email info@EMSL.com. EMSL Analytical, Inc. is one of the leading testing laboratories with over 40 locations throughout the United States and Canada. EMSL is a nationally recognized and locally focused provider specializing in fast laboratory results for mold, bacteria, Legionella, USP <797>, pathogens, asbestos, lead, soot, char & ash from fires, VOC’s, odors, radon, formaldehyde, indoor air quality, microbiology, environmental, industrial hygiene, radiological, food, beverage & consumer products and material testing services for the identification of unknown substances. EMSL services both professionals and the general public. EMSL maintains an extensive list of accreditations from leading organizations as well as state and federal regulating bodies including, but not limited to A2LA, AIHA LAP, LLC. (AIHA EMLAP, AIHA IHLAP, AIHA ELLAP), NVLAP, CDC ELITE, CPSC, CA ELAP, NY ELAP, TX DOH, NJDEP and multiple other state accrediting agencies. Please visit our website at www.EMSL.com for a complete listing of accreditations. In addition, EMSL carries a wide range of Sampling Equipment and Investigative Products for environmental professionals.